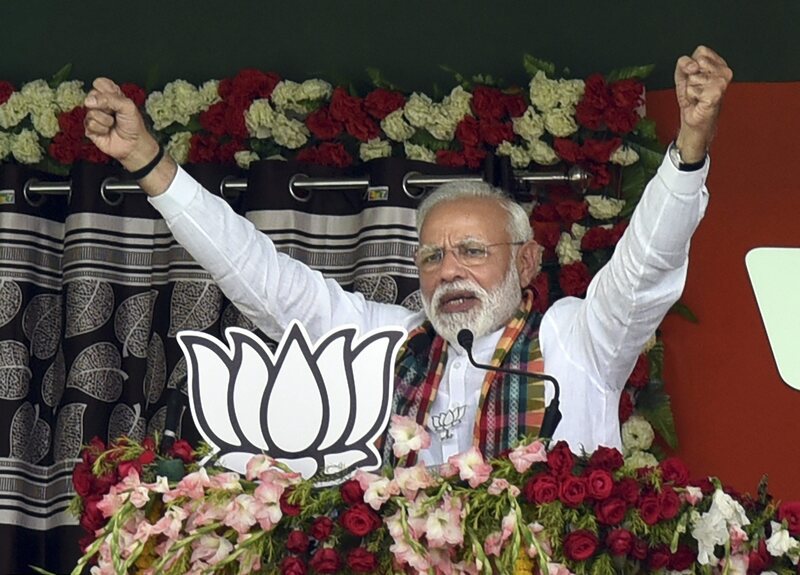 Election Tracker LIVE Updates: Prime Minister Narendra Modi today equated the Congress with "sinking Titanic" and said that their ship is submerging with each passing day. "All those who are sailing with Congress are either drowning like the NCP or are swimming away to safety," he said while addressing a rally in Nanded. Continuing his attack on Congress president, PM Modi reiterated that "naamdaar" (a term he uses to attack Rahul Gandhi) seems to have "used a microscope" to find himself a seat where the "minority is the majority". "He knows that he will not win Amethi. The seat now is such where the minority is the majority. Did you see his rally? Where were the Congress flags? Did you see the pictures on social media? Did you see any Congress flags?" PM Modi asked the gathering. Senior Bengal Cops Behaving like TMC Cadres, says Dilip Ghosh | West Bengal BJP president Dilip Ghosh Saturday mocked at Chief Minister Mamata Banerjee for writing to the Election Commission over the transfer of four IPS officers and claimed that many more transfers are in the pipeline. "This is just the beginning. Many more list of such transfer are on the pipeline. Why is the chief minister so angry? Is it because her plans to use the police to help her cadre loot votes and engage in rigging has fallen flat," Ghosh said. Election Commission of India has directed Union minister and Asansol MP Babul Supriyo to not use his song for election campaign. The EC has barred Supriyo from using his song even on any social media platform. EC Decision on Modi Biopic Unlikely Before Monday | The Election Commission is unlikely to take before Monday a final decision on whether to restrain the release of a biopic on Prime Minister Narendra Modi till the Lok Sabha polls are over, as the Supreme Court is slated to hear the issue that day. The EC has been made a party in a plea filed by a Congress worker who wants the top court to delay the film's release claiming it "disturbs" level-playing field for candidates in the Lok Sabha polls. Uttar Pradesh chief minister Yogi Adityanath will address two public meetings in Telangana on April 7 in the run up to the coming Lok Sabha elections in the state, BJP sources said. NCP chief Sharad Pawar on Saturday hit back at Prime Minister Narendra Modi for claiming there were disputes in the former's family. Pawar said the insinuation was coming from a man who did not have any experience of a family, nor does he know where they are presently. PM Modi, during a rally in Wardha on April 1, had said that Pawar was losing his grip on the Nationalist Congress Party which was hit by a "family feud". Union Textile Minister Smriti Irani attacked the Congress on Saturday, saying the party had cheated the people of Amethi for 55 years. "Ram's 'vanvas' (exile) ended in 14 years, but Amethi's vanvas is going to end after 15 years. The people of Amethi are going to bid farewell to the 'naamdar' (dynast) on May 6 (polling day). The congress cheated the people for 55 years," Irani said. Putting all speculation to rest, the Bharatiya Janata Party (BJP) on Saturday announced the candidature of Diya Kumari, a member of the erstwhile royal family of Jaipur, from the Rajsamand parliamentary seat. The BJP also announced candidature of Kailash Chaudhary from Barmer, Manoj Rajauriya from Karuali-Dholpur and Ranjeeta Kohli from Bharatpur. Talk of Diya Kumari being fielded in the Lok Sabha elections was rife since Assembly elections in 2018 when she was not given a ticket. It was expected that she would be making her debut on the national stage in the 2019 general elections. Sources said fielding of Kumari was part of the BJP aim to woo the influential Rajput community of Rajasthan. CPI(M) general secretary Sitaram Yechuri on Saturday termed Prime Minister Narendra Modi and BJP president Amit Shah as 'Duryodhona' and 'Dusshana' and said there could be a post poll alliance after the elections because it has happened earlier also. Actor Vivek Oberoi, who plays Prime Minister Narendra Modi in a yet-to-be-released biopic, on Saturday said he "might think" of contesting from Vadodara in the 2024 Lok Sabha polls "if he joins politics". The actor was participating in an interactive session with students of Parul University here to promote the Omung Kumar-directed film 'PM Narendra Modi'. EC showcause to government school principal for allowing poll meet on premises | The election commission Saturday issued a showcause notice to a government school principal here for allegedly allowing the local MLA to organise an election meeting on the premises on the pretext of a Holi get-together. District election officer Kumarpal Gautam served the notice to the principal of the government middle school at Madiya village of the Nokha town, asking him to file a response within 24 hours. It is alleged that the principal allowed Nokha BJP MLA Biharilal Bishnoi to organise an election meeting on the pretext of the get-together on the Holi day, March 21. 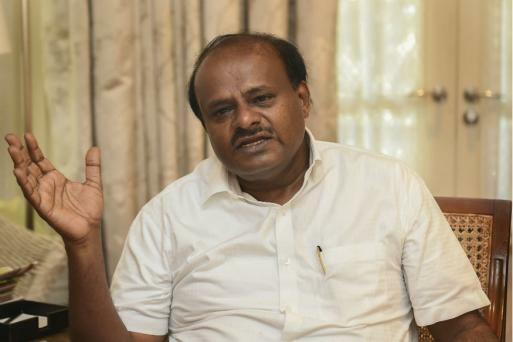 Internal strife in Cong-JDS combine at its peak: R Ashoka | BJP leader and former deputy chief minister R Ashoka claimed on Saturday that the mistrust between the ruling partners in Karnataka was growing and it has peaked during the days ahead of the Lok Sabha elections. "This is mostly evident in Mandya where actress Sumalatha Ambareesh is contesting against chief minister H D Kumaraswamys son Nikhil," Ashoka said. Union minister Giriraj Singh on Saturday filed his nomination papers from Begusarai Lok Sabha constituency where he is locked in a keenly-watched triangular contest with RJDs Tanveer Hassan and CPI debutante Kanhaiya Kumar. The firebrand BJP leader performed worship at a local Shiva temple before reaching the collectorate keeping the affair rather low key in view of Fridays mishap on the outskirts of the town where a truck had ploughed through a roadside hut killing seven people, including a minor girl. Talking to reporters on the occasion, Singh claimed that he was sensing an "unprecedented" enthusiasm among the voters of the constituency who seemed to display "full faith in the country’s development, the valour of our armed forces and the leadership of Prime Minister Narendra Modi." The former AIADMK leader says that after May 23 (the day election results will be announced), the party's 'two leaves' symbol and cadres will be with him. BJP's Suresh Nakhua has filed a criminal complaint against Congress candidate for Mumbai north Urmila Matondkar. The complaint states, "She has hurt religious sentiments of Hindus by calling 'Hinduism the most violent religion in the world' on a TV show". The names of Congress president Rahul Gandhi and a journalist are also included in the complaint. In a blistering attack on Prime Minister Narendra Modi, Andhra Pradesh chief minister N Chandrababu Naidu on Saturday said he is like a "dreaded terrorist" who has no humanity left in him. Addressing election rallies in Prakasam district, the Telugu Desam Party (TDP) President said Modi has become a dictator. "He is murdering democracy and ruining institutions," said Naidu. For a second consecutive day, the TDP chief slammed Modi for using central agencies to target TDP leaders. He also lashed out at the Election Commission for shunting out chief secretary AC Punetha. "I am asking what mistake he committed that you have transferred him?" The Congress on Saturday expelled AICC member Amrith Shenoy from the party for a period of six years for anti-party activities, sources said. Shenoy, who filed his nomination as an independent candidate against the Congress- JD(S) combine candidate Pramod Madhwaraj in Udupi-Chikkamagaluru Lok Sabha constituency, had refused to withdraw his papers. Prime Minister Narendra Modi will arrive in Mangaluru on April 13 to campaign for the BJP ahead of the Lok Sabha elections, party sources said. He will address an election rally at Nehru Maidan in the city at 3.30 pm in which more than a lakh people will take part, the sources added. Uttar Pradesh chief minister Yogi Adityanath on Saturday took a dig at his Odisha counterpart Naveen Patnaik and said the BJD president is contesting Assembly election from two seats "fearing" defeat in his home turf Hinjili in Ganjam district. PM Modi continues his stinging attack on Congress. He says that the grand old party is like a sinking Titanic and its allies are either drowning or swimming away. 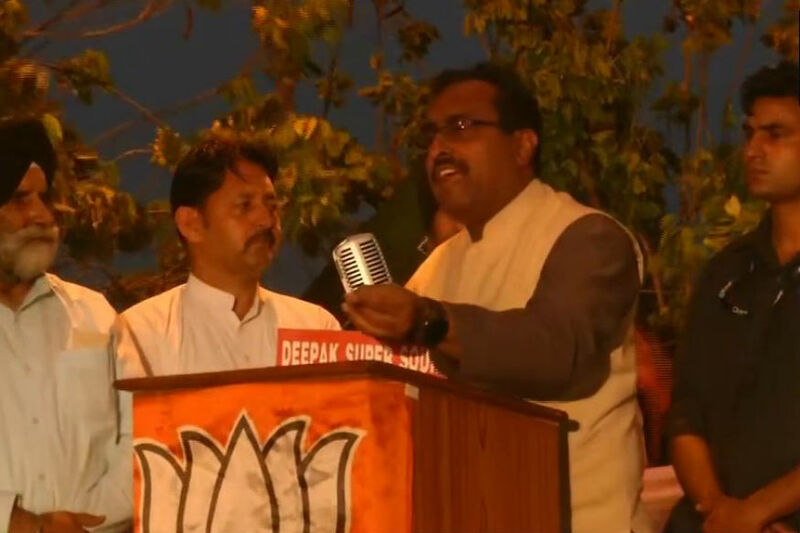 BJP national general secretary Ram Madhav slammed the Congress manifesto while addressing an election rally in Jammu. “It appears as if this manifesto has been made to gather votes of the separatists of Jammu & Kashmir. There is no all India vision in it. 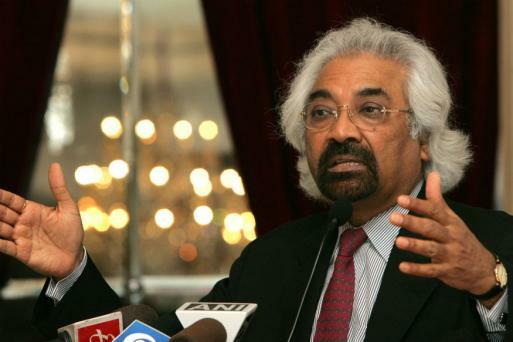 It is a manifesto made for vote-bank only,” said Madhav. 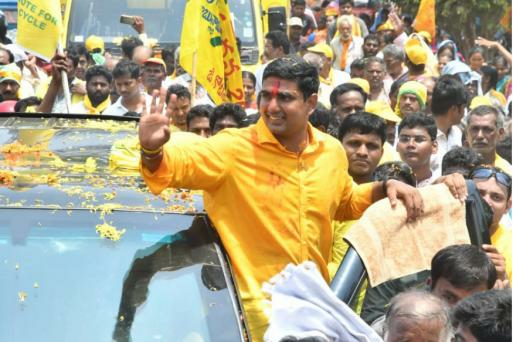 CLICK TO READ | Will IT Come in Handy to Naidu's Son Nara Lokesh in his Poll Debut from Mangalagiri? While sitting YSR Congress MLA Rama Krishna Reddy is known among locals for taking up their issues with the state government, the TDP young gun is seeking votes in the name of development. Congress leader Priyanka Gandhi Vadra slammed the BJP on Saturday for turning patriotism into an election issue and ignoring the poor and farmers, saying had the ruling party leaders been patriots they would not have been "selective" in respecting martyrs. Addressing a 'nukkad sabha' in favour of Congress nominee Rakesh Sachan here, the Congress general secretary incharge of eastern Uttar Pradesh said, "The issue of patriotism is raised whenever elections come, but the real questions on farmers, unemployed, women safety are left behind." Time to get rid of those who have put democracy in danger: Gehlot | Rajasthan chief minister Ashok Gehlot on Saturday said it was time to get rid of powers that have created an "environment of hatred" in the country and put democracy in danger. Addressing a rally in Banswara ahead of the Lok Sabha polls, Gehlot said: "There is an environment of hatred in the country. The country is getting ruined." "Democracy and the Constitution are in danger. It is time now that we get rid of them," he said at the rally in support of Congress candidate Tarachand Bhagora. Stressing that there was no difference in the words and deeds of the Congress, Gehlot said that the party has fulfilled its promise of waiving-off farm loans after coming into power in the state. The Narendra Modi government at the Centre is serving the interest of big business houses and is "anti-farmer", CPI leader D Raja said on Saturday. Raja also dubbed the BJP-led government as "anti-people" and "anti-women". "Modi government is serving the interests of finance capital, of big business houses and of big corporate houses. Modi government is not with the people. It is anti-people, anti-farmer and anti-women," he said. A special press conference to launch Congress Party’s publicity campaign will be held on Sunday at 12 noon at AICC headquarters. The slogan of Congress for 2019 Lok Sabha elections will be launched tomorrow. Odisha chief minister and BJD president Naveen Patnaik Saturday sought to know from the BJP the reason behind discontinuation of funding for KBK scheme after Prime Minister Narendra Modi criticised the state government accusing it of lacking intent to eliminate poverty. Patnaik raised the issue while addressing an election meeting in Nabarangpur district, one of the poorest areas among the KBK (Kalahandi-Bolangir-Koraput) region. PM Modi in Maharashtra’s Nanded: The naamdar seems to have used a microscope to find a seat for himself since he knows that he will not win Amethi. The seat is such where the minority is the majority...did you see his rally? Where were the Congress flags? Did you see the pictures on social media. Did you see any congress flags? At Rally, UP BJP Leader Refers To Lord Ram, Hanuman As 'Chowkidar' | A BJP leader has termed gods 'chowkidars' during a public meeting in Uttar Pradesh's Shahjahanpur district, according to a video that has surfaced on social media. The video purportedly shows Manoj Kashyap, former convenor of the 'Braj Prant', an unit of the Bharatiya Janata Party for the 'Braj' (Mathura-Vrindavan) area, raising slogans at a youth workers' meeting on Tuesday. Kashyap can be seen chanting "Mera Ram" (my Ram), and the crowd responding with "chowkidar" (watchman). Similarly, slogans like "mera Shankar" and "mera Hanuman" were followed by chants of "chowkidar". At an election rally in Chhattisgarh's Balod, Prime Minister Narendra Modi kept up his attack on the Congress and accused the party and its allies of fighting for their own victory in the upcoming Lok Sabha elections. "We are fighting for the nation's victory, while the Congress is fighting for its own victory," he said. Advani, who was recently dropped from the poll fray, had written a blog on Thursday, emphasising that the saffron party advocates for freedom of choice and does not believe in branding people "anti-national" for their different political stand. "Right from its inception, the BJP has never regarded those who disagree with us politically as our 'enemies', but only as our adversaries. Similarly, in our conception of Indian nationalism, we have never regarded those who disagree with us politically as 'anti-national'. The party has been committed to freedom of choice of every citizen at personal as well as political level," he wrote in the blog ahead of the BJP's foundation day on April 6. His views assume significance at a time when the BJP under Prime Minister Narendra Modi and party president Amit Shah have made the issue of national security a key plank for the general elections and have often accused its political rivals of speaking the language of India's enemies like Pakistan.